After a marathon hearing which lasted from morning till 3 PM, the Supreme Court constitution bench today reserved judgment in a bunch of review petitions filed against the September 28 judgment, which declared right of women of all age groups to enter the temple. The Constitution Bench of CJI Gogoi, and Justices Khanwilkar, Nariman, Chandrachud and Indu Malhotra heard the arguments of petitioners and respondents today. In the morning session, Senior Advocates K Parasaran, V Giri, Dr. A M Singhvi, Shekhar Naphade and R Venkatramani submitted arguments for the petitioners, which included Nair Service Society, thanthri of the temple and former Chairman of Travancore Devaswom Board . They essentially argued that the practice at temple was based on the celibate character of the deity. The petitioners also submitted that constitutional morality was a subjective test, which should not be applied in matters of faith. Religious beliefs cannot be tested on basis of rationality. 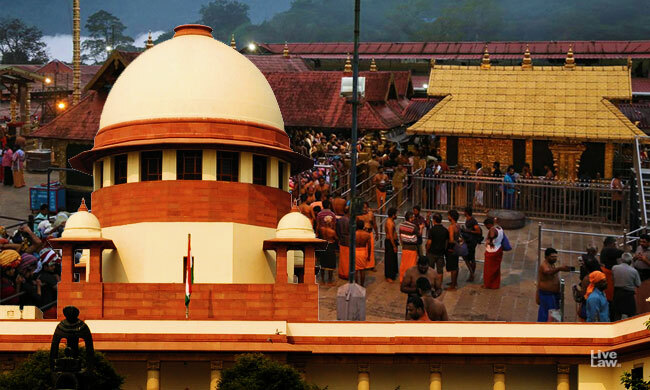 The right to worship has to be exercised in consonance with the nature of deity and essential practice of the temple.They also submitted that the judgment erroneously imported the concept of "untouchability" under Article 17 to the situation of Sabarimala temple, without understanding its historical context. The Court also head Advocates Sai Deepak and Gopal Sankaranarayanan who appeared for two of the petitioners.The lawyers of other petitioners were directed to submit their written submissions within 7 days.A detailed account of the hearing of the petitioners may be read here. The Government of Kerala, which was represented by Senior Advocate Jaideep Gupta, opposed the review petitions. He said that no grounds were made out for review. Essential practice of an individual temple cannot be regarded as essential practice of a religion. Exclusion of women was not essential to Hindu religion, submitted the counsel. A detailed account of the submissions of Kerala government may be read here. The Travancore Devaswom Board opposed the review petitions through Senior Advocate Rakesh Dwivedi. The change in stance of the Board, which had opposed women entry earlier, elicited a query from Justice Indu Malhotra. At this, the counsel replied that the Board has decided to respect the judgment. Senior Counsel Indira Jaising, appearing for two women - Bindu and Kanaka Durga- who entered the temple, submitted that they were facing intense threats after temple entry. This was not a mere case of exclusion, but social boycott. The purification ritual conducted after temple entry validates the finding of the court that the practice amounted to untouchability. Menstruating women are regarded as polluted and impure, she said. She also sought for positive directions to assure protection for women who have made online booking to visit temple on its next opening day, February 12. "Mobs should not interfere with the right of women to visit temple", she said. The Court also heard the arguments of an intervenor, who submitted that the argument that ban on entry of women in the age group of 10-50 years was necessary to protect celibacy was derogatory. The argument amounts to depicting a 10 year old girl as a sexual object, the counsel submitted. After hearing the arguments, the Court reserved orders.